For anybody who is a travel addict, finding a way to get cheap airline tickets is something you are always keeping your eyes open for. Recently I came across a new service which is an absolutely great way for you to get cheap flights, so I wanted to do a comprehensive Scott’s Cheap Flights Review to help anybody out there who is considering using this service. Scott’s Cheap Flights initially hit me as a service which wouldn’t really be that useful, but after doing some further research and subscribing for a premium account I began to notice the reality of how great this service really is. To help you make an educated purchasing decision, let’s now break down everything that you could get with a premium account at Scott’s Cheap Flights. Many people don’t realize that one of the best ways to get a great deal on airline tickets is to constantly be checking for prices right as the new deals are added. Sometimes airline companies errantly (or purposefully) give out reduced fares which quickly get booked simply because of their reduced price. This is exactly where Scott’s Cheap Flight service comes in. More than likely, you are not an airline nerd who wants to be on the computer checking for fares all day, every day. Thankfully, we have people like Scott who will do this for us at a very reasonable price. -Delayed e-mail alerts in your inbox of deals that are left over from premium subscribers. -Instant e-mail and text message alerts of flight deals as soon as Scott finds them. -Scattered departure cities. -Custom departure city selection. -1/3 of the best deals. -All of the best deals. This feature is one of the biggest reasons you will want to want to purchase a premium subscription. If you simply sign up to the e-mail list you should expect to receive deals from an array of different cities, none of which are necessarily close to your local airport. With a premium subscription, you will be able to select your country of residence. 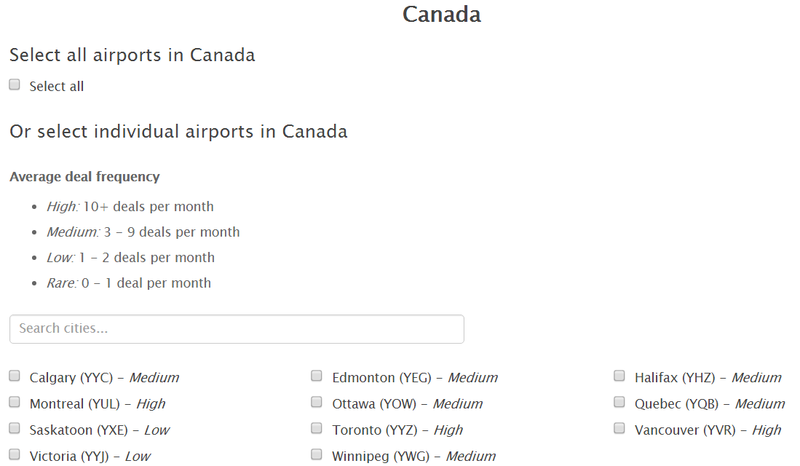 Then, you will also be able to select the specific airports you would like to depart from. This is very helpful in making sure you only receive deals that are relevant to yourself personally. At the time of writing, Scott’s Cheap Flights sends deals from the USA, Canada, Australia, New Zealand, and Europe. Asia and South America are expected to begin receiving departure service in the coming months. In the meantime, if you would like to request for your country to start receiving flight deals from Scott, simply use this country request tool. Countries are being added continually to make this a service for anybody in the world. Long story short, Scott’s Cheap Flights service is not one where he sells you scalped flight tickets, or ones with higher prices for some sort of commission. What you pay for when you sign up for a premium subscription is the financial support Scott needs so that he can continue to slave night and day for you to help you find great deals on international flights. Are you taking an upcoming trip? Use this FREE $40 Off New Airbnb reservation! -Cheap flight service to help you find great deals. -Run by human searchers who work every day to find the best deals. -Reasonably priced, starting at $15. -Buying one flight will pay for the subscription price, and then some. -E-mail & Text message alerts of all the latest deals. -International destinations, sometimes for less than $300 round trip. -Deals sent to you every day. -Does not offer domestic flight service. 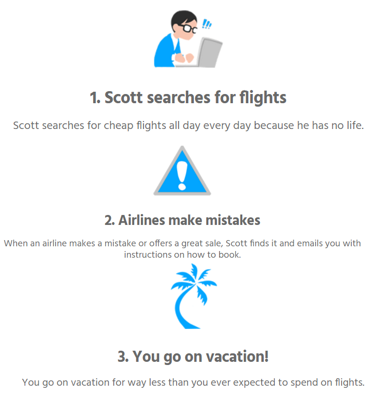 -No flight searching tool, you need to wait for Scott to find the deals. Looking at some of these prices should be enough to convince you that you are really getting a lot of bang for your buck with Scott’s Cheap Flights. Of course, most of the best deals don’t find their way to Scott’s main page, so imagine being able to see deals like the ones above and below on a consistent basis. With this service, you can start to plan trips that you would otherwise not even deem possible because of money. Sometimes the hardest part of traveling is being able to find deals that are within your budget. This is why so many people are looking to some sort of cheap flight service to find deals for them. After searching through various cheap flight services, Scott’s Cheap Flights remains as the best service available on the market. Other services, which typically depend on commissions or reselling tickets, simply cannot keep up with the excellent deals and offers sent out every day by Scott. If you buy just one ticket you will quickly realize how much money you can save in both the short and long-term with this service! We hope this Scott’s Cheap Flights review was helpful and informative! If you are going on a trip sometime this year, make sure you check out my Best Travel Gear of 2017 post to figure out what gear you need to have with you on your upcoming trip! Do you have an upcoming trip? 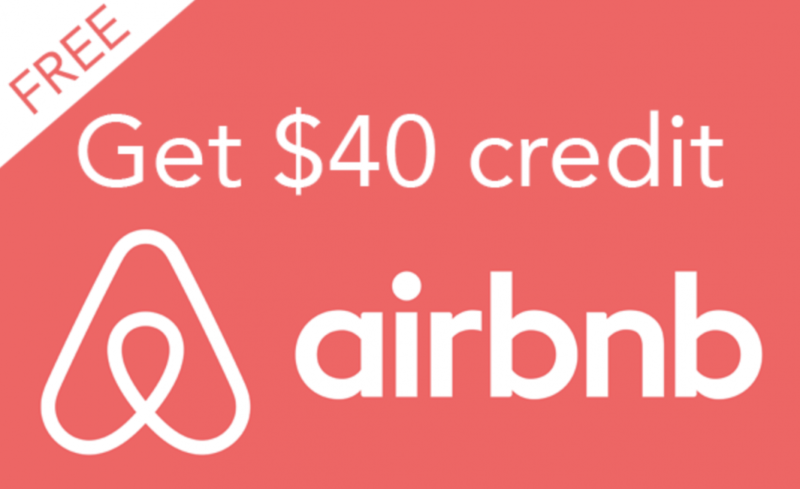 Use this FREE $40 Off New Airbnb reservation! Hello,I log on to your blogs named “Scott’s Cheap Flights Review -” on a regular basis.Your story-telling style is awesome, keep up the good work! And you can look our website about love spell.